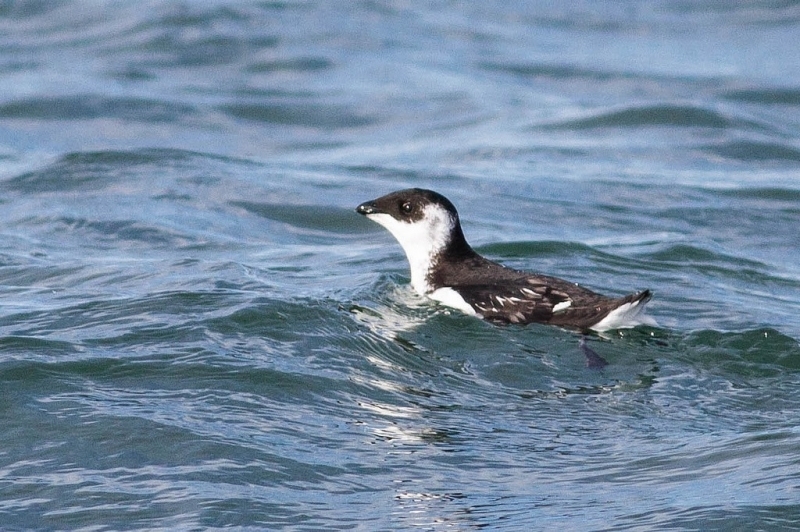 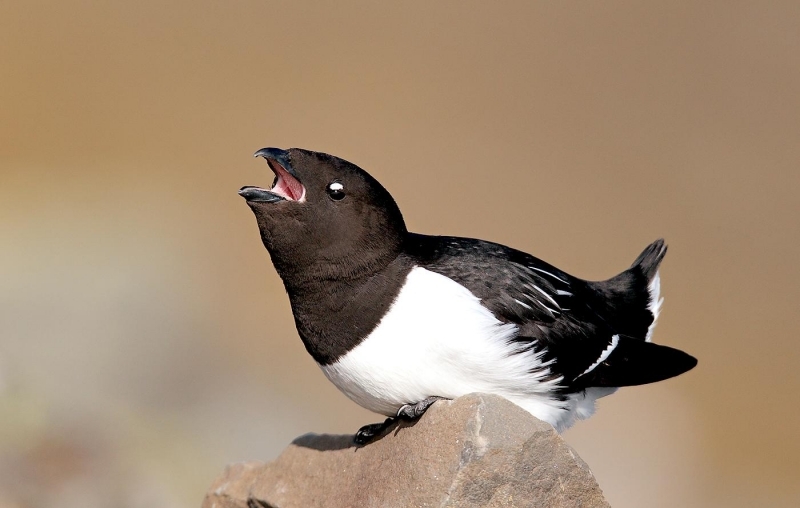 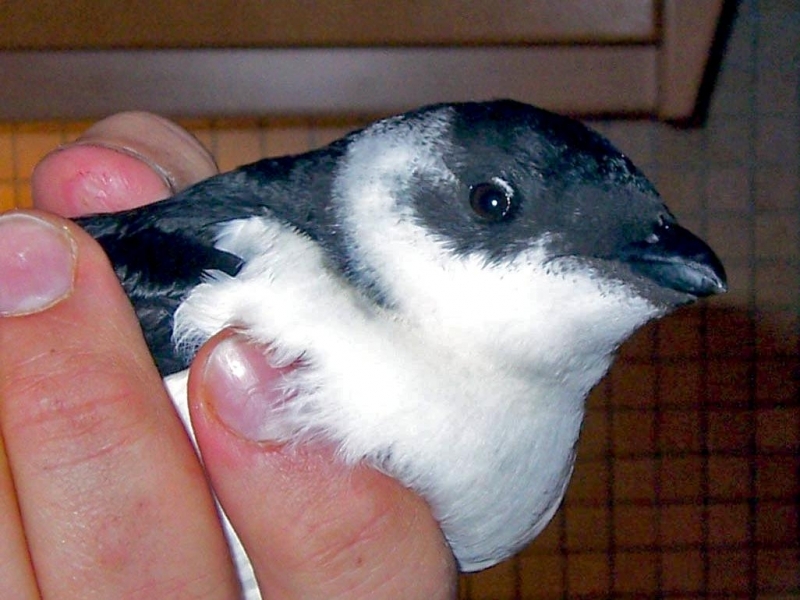 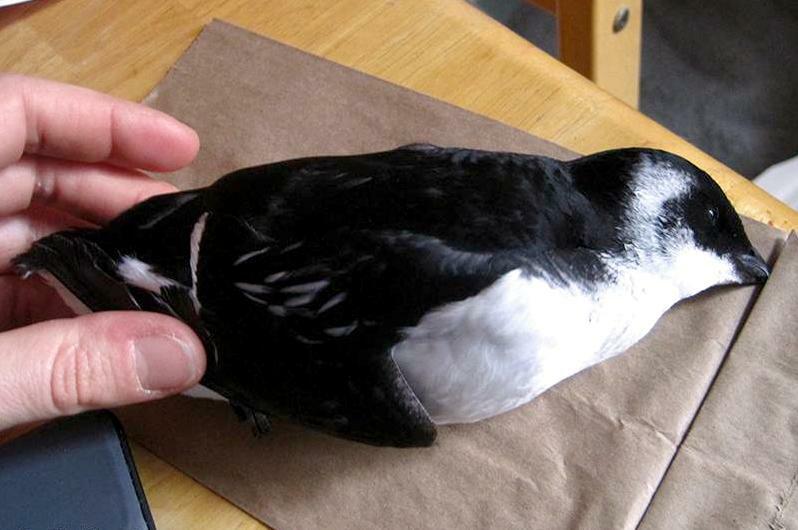 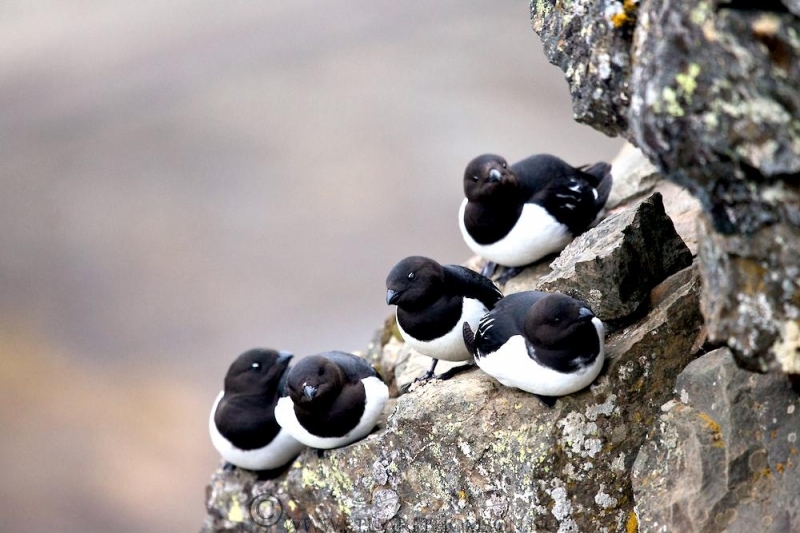 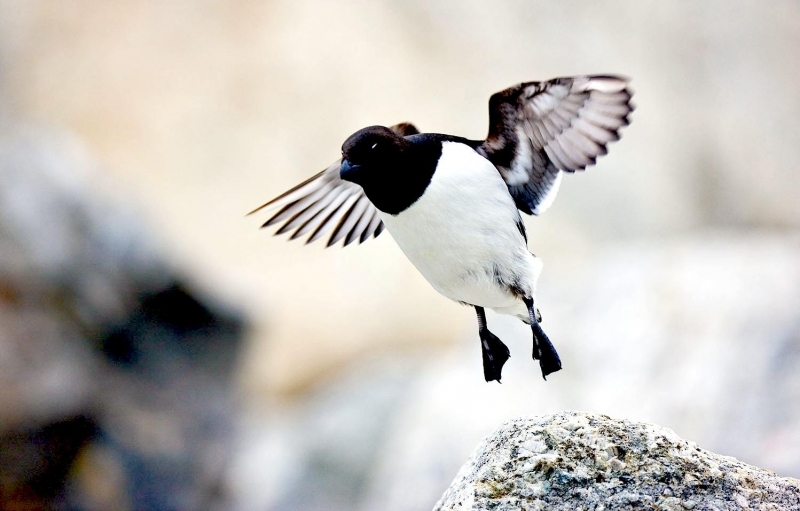 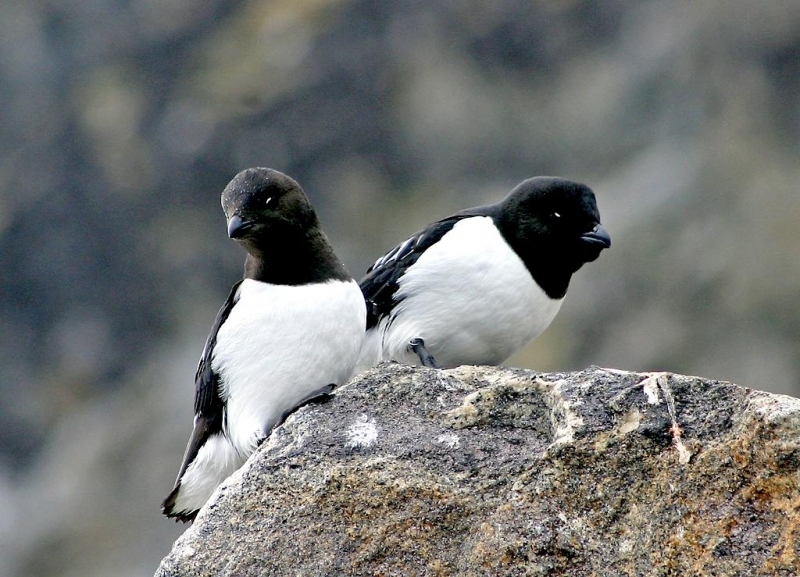 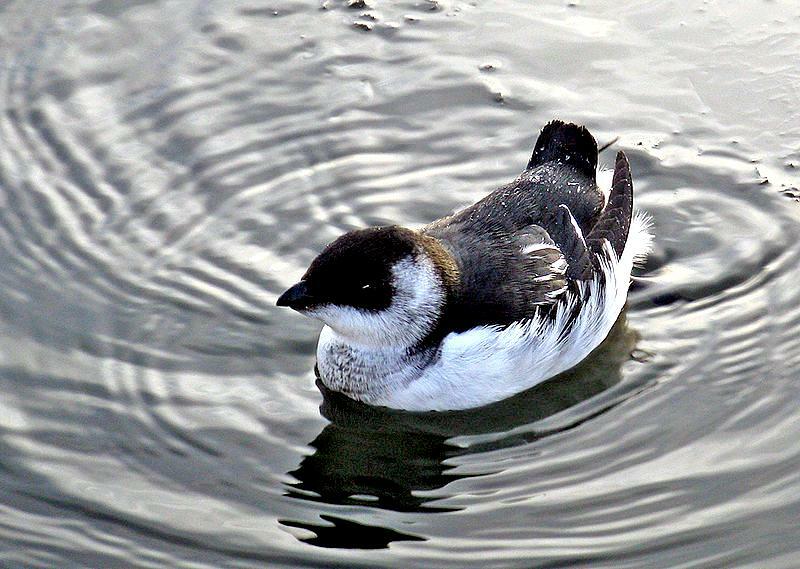 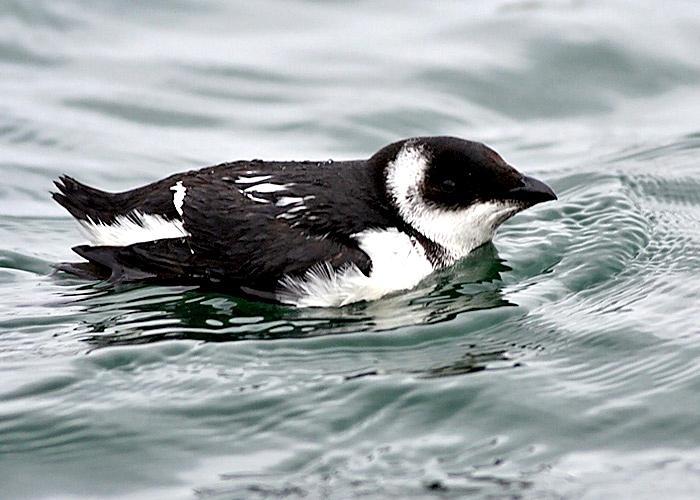 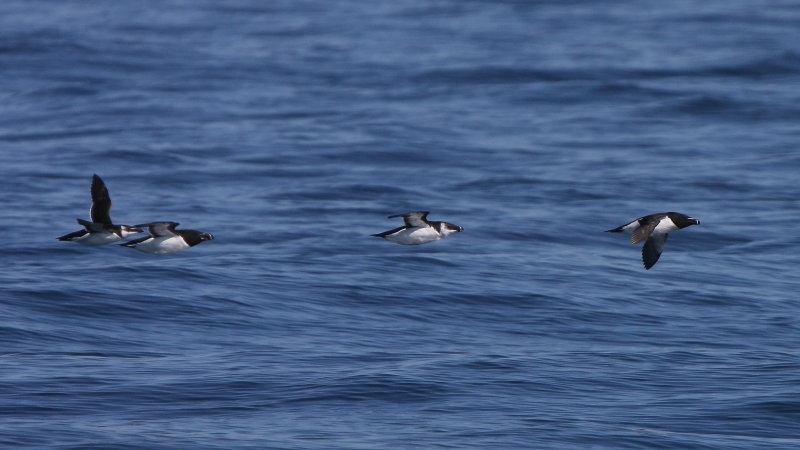 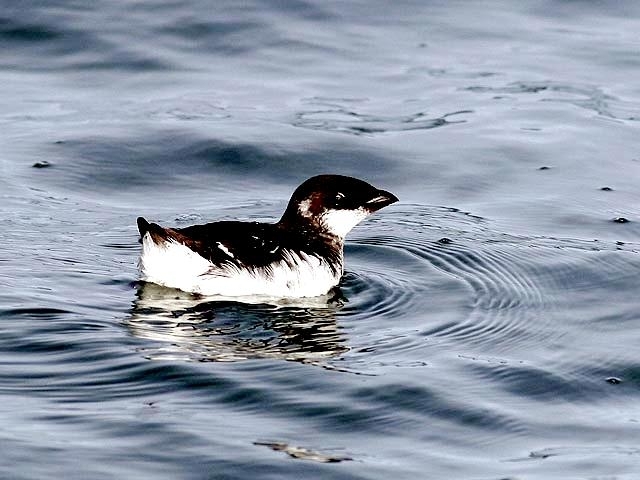 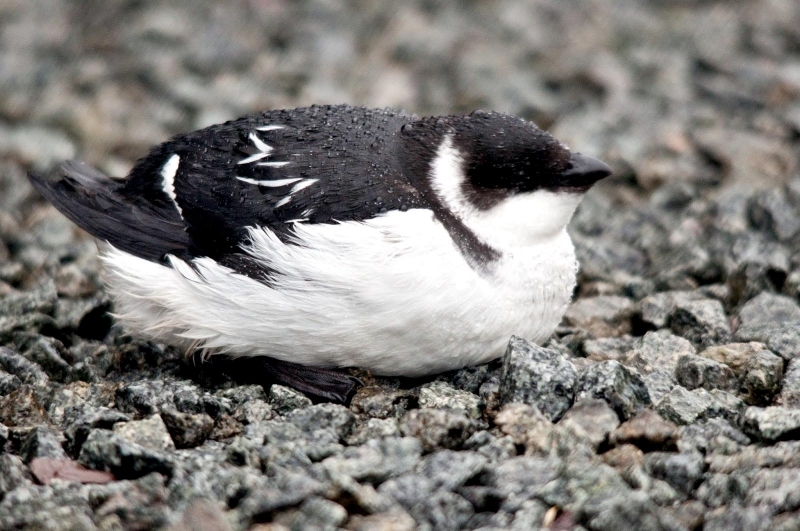 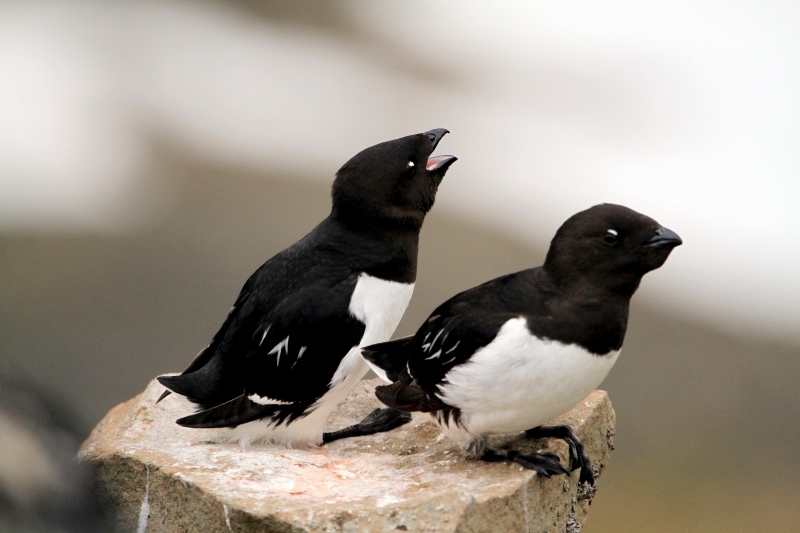 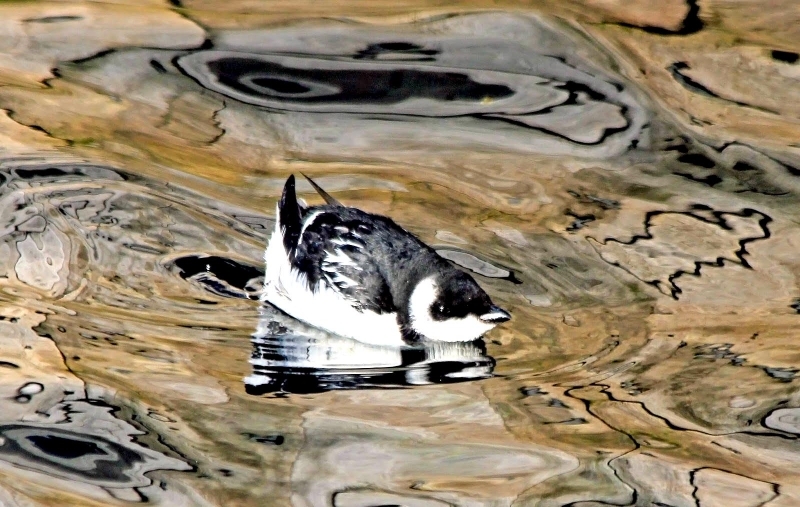 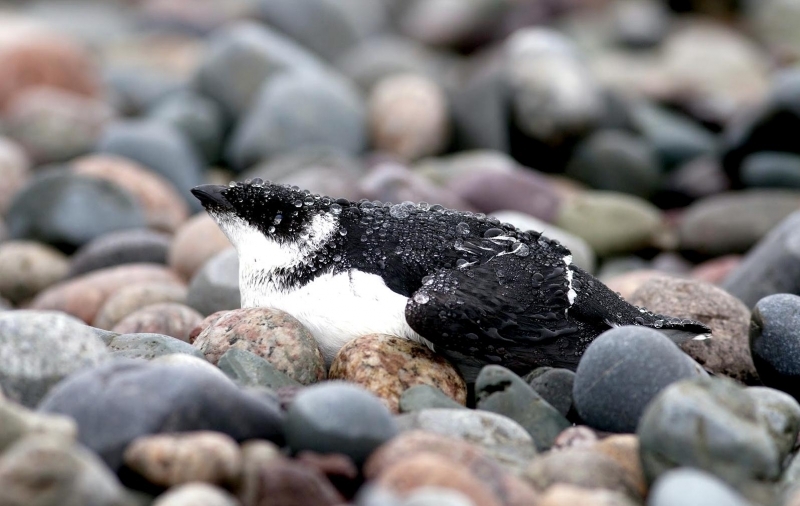 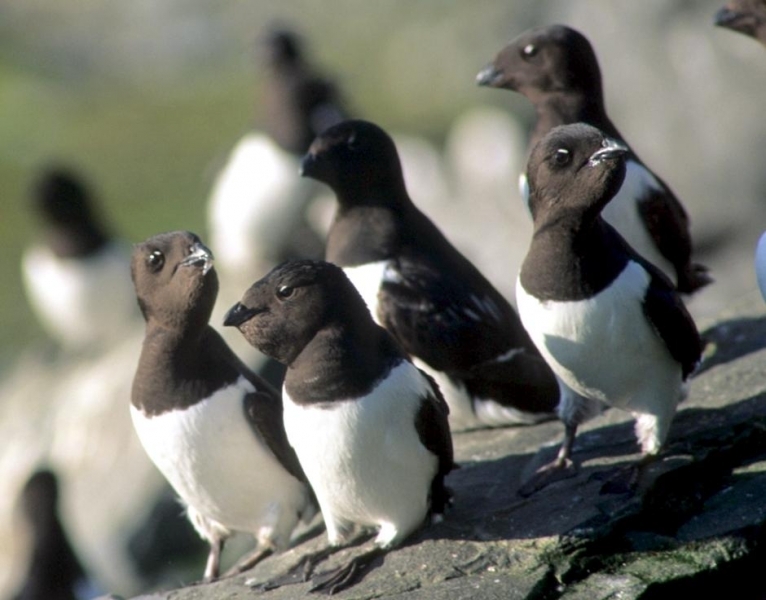 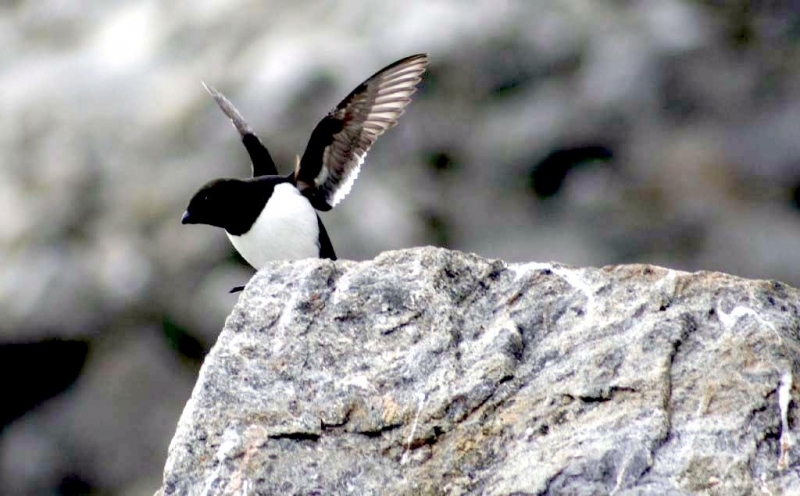 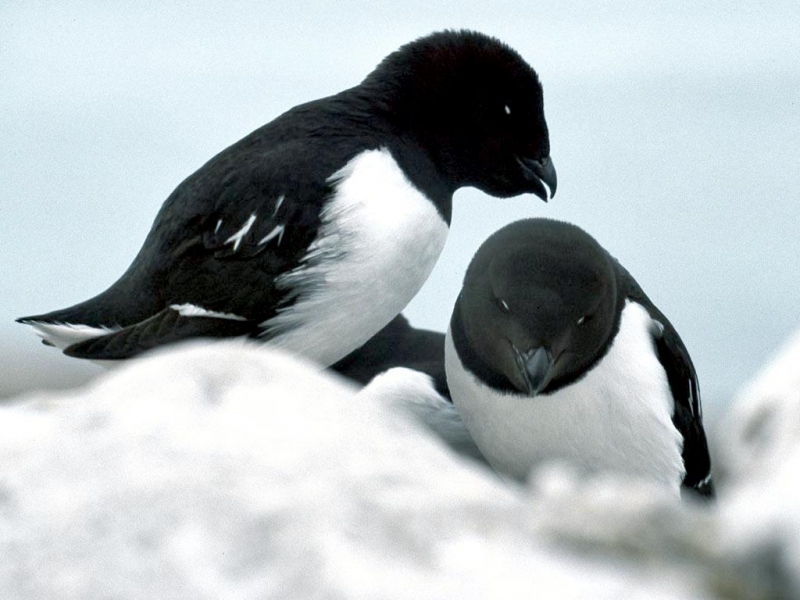 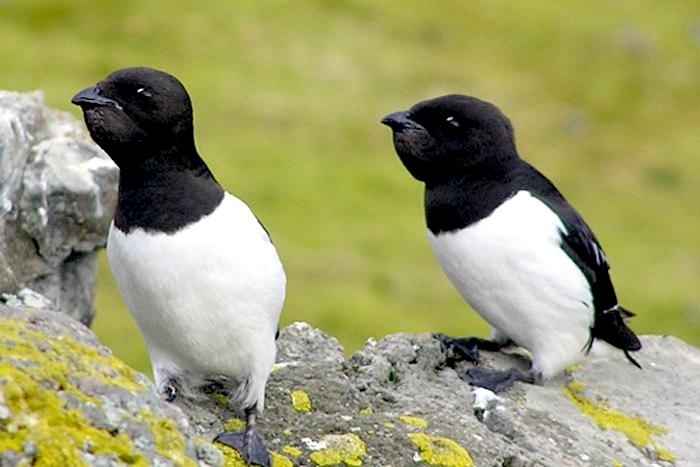 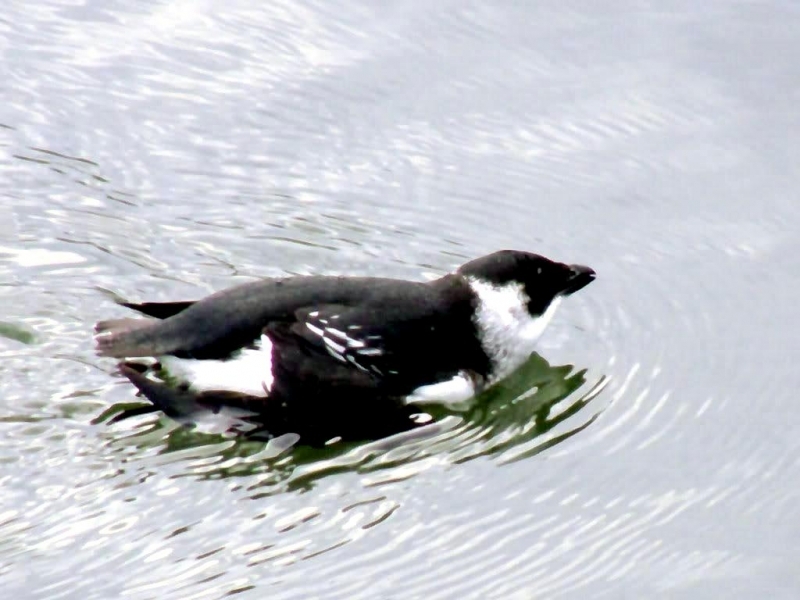 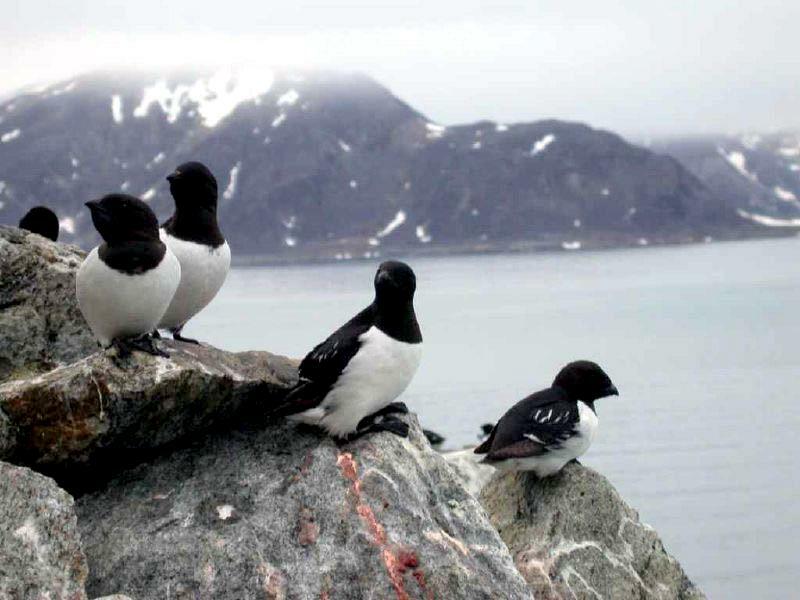 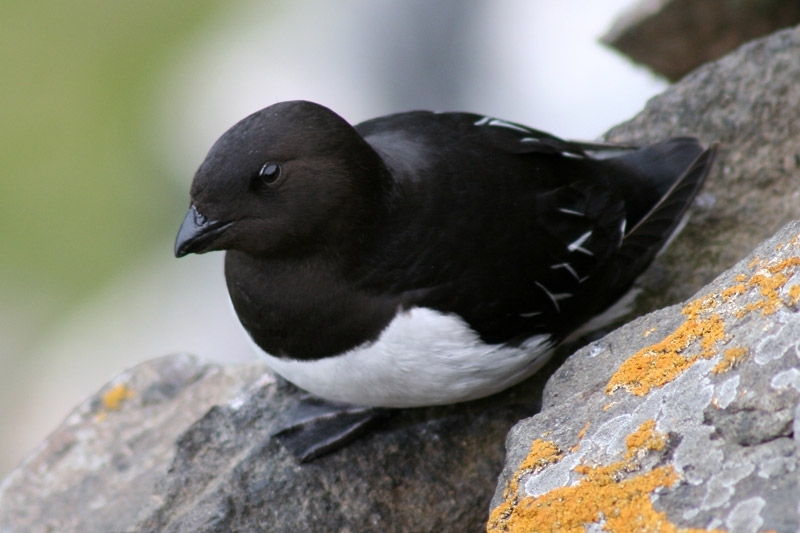 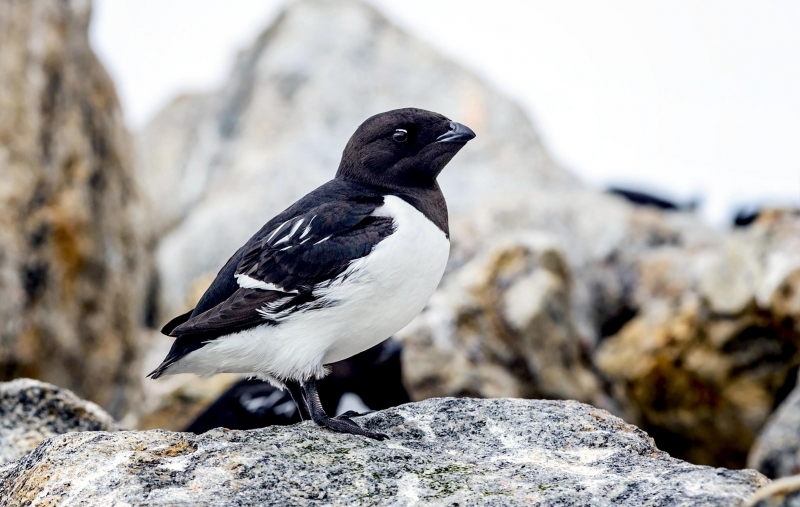 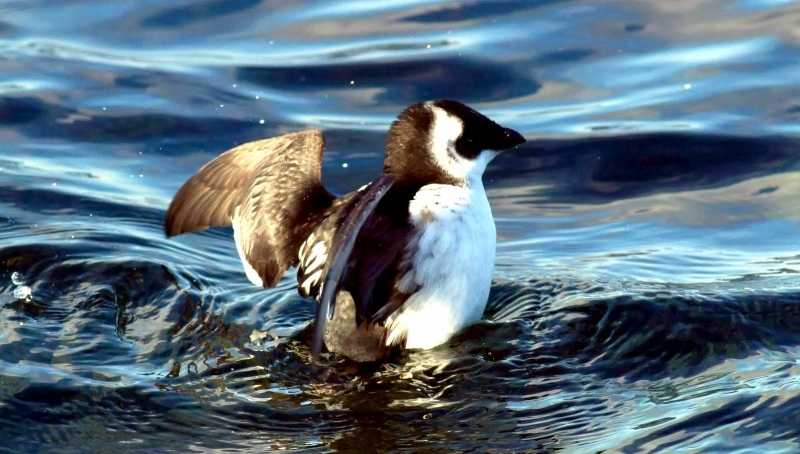 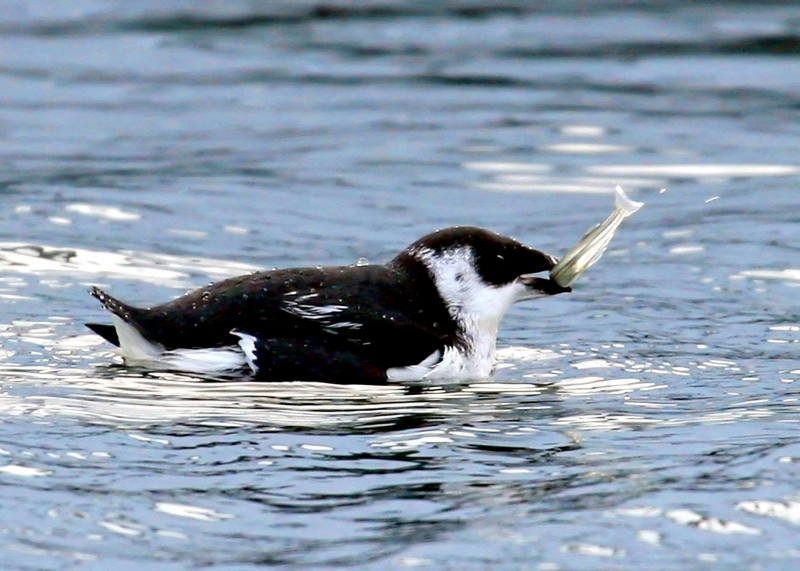 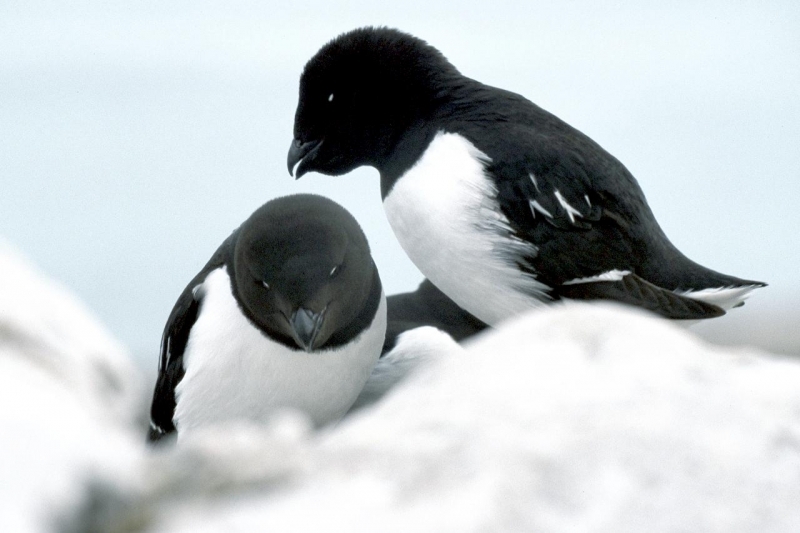 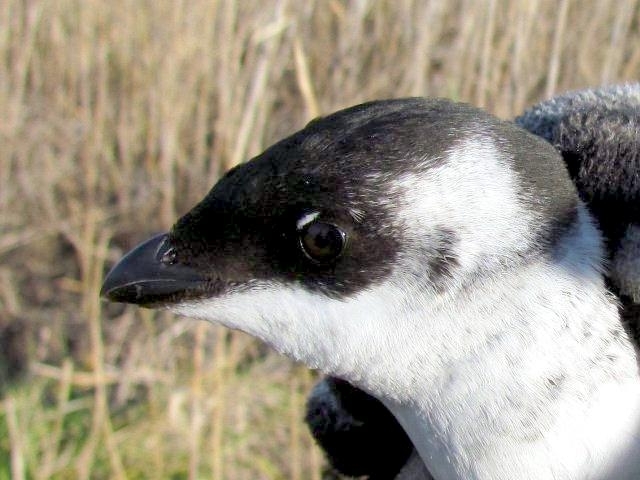 The smallest of all auks, the Dovekie is also known as the Little Auk. 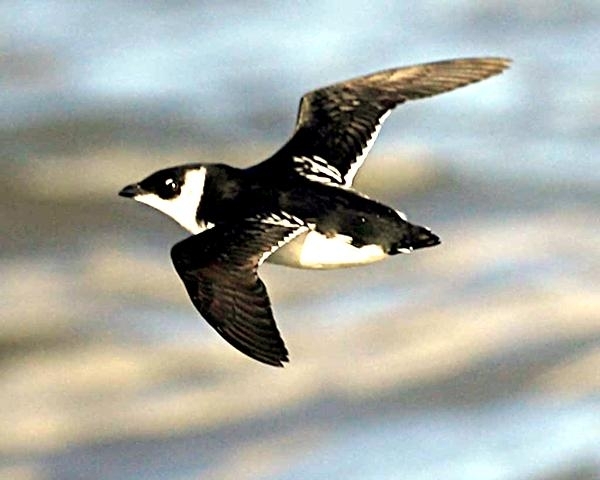 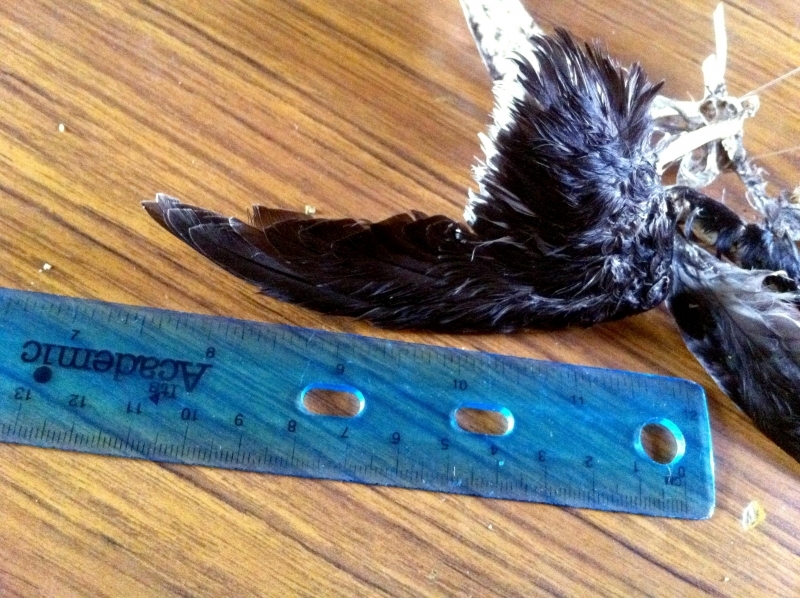 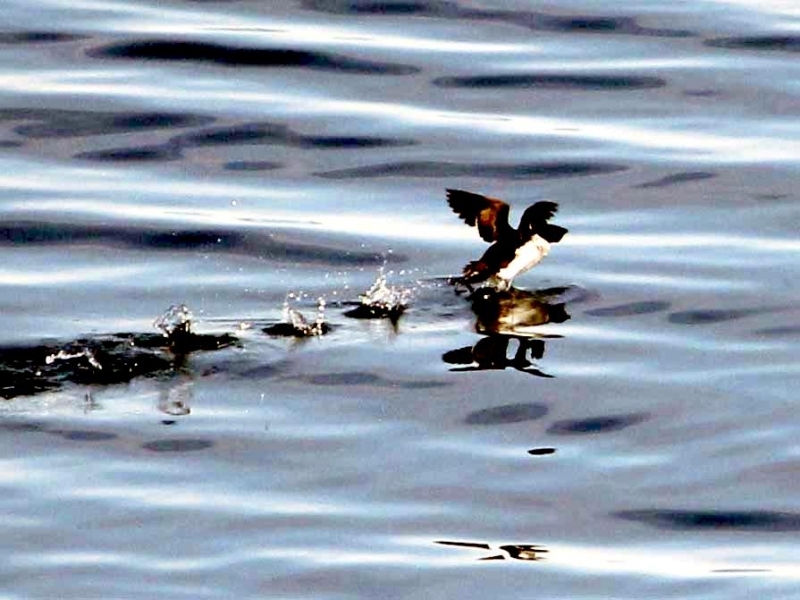 It is a tiny seabird, around the size of a Starling, with distinctive bold black & white plumage. 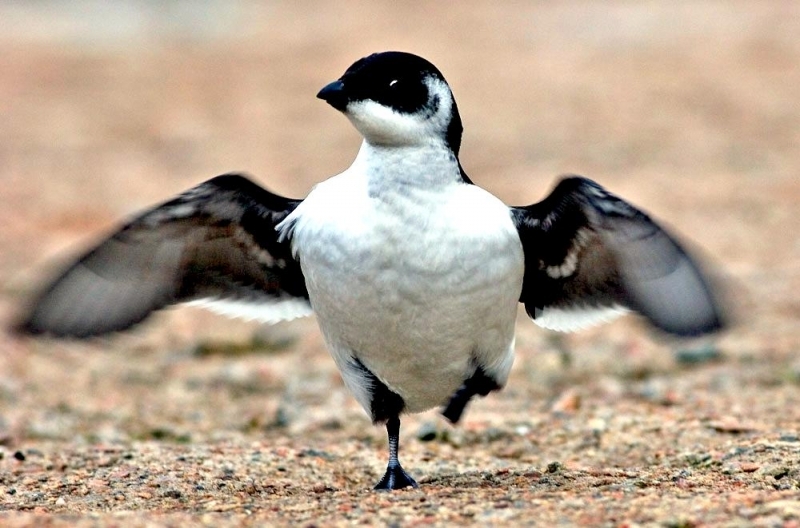 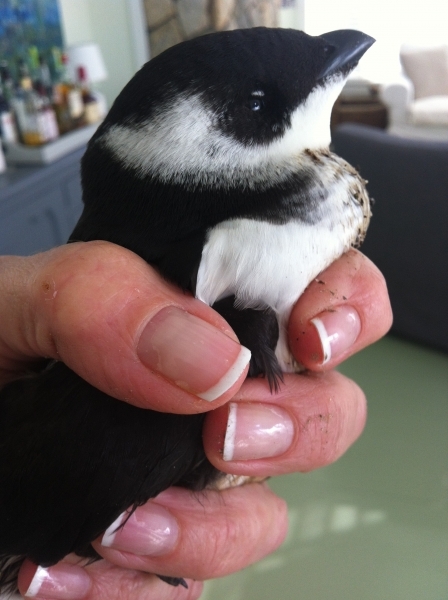 During the breeding season the Dovekie is almost entirely glossy black except for white underparts stretching from the belly to under the tail, a small white arc around the eyes and white streaks on the wings. 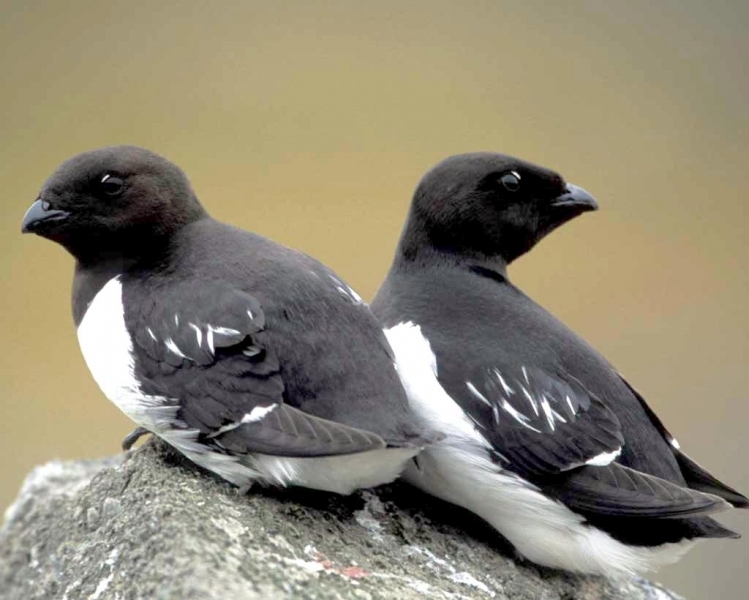 At other times of the year, the white patches extend from the breast to the chin & throat and in a wedge shape along the rear of the head. 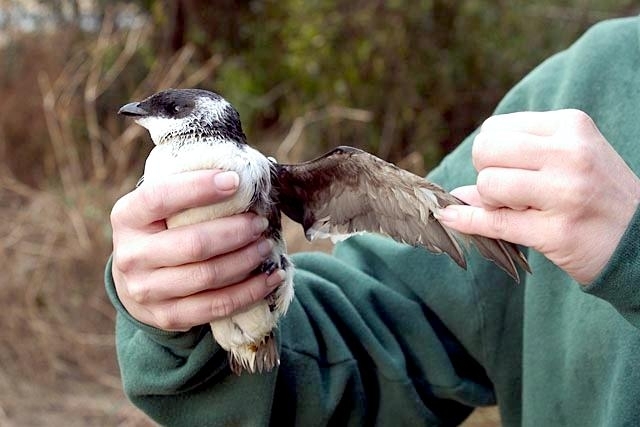 The juvenile Dovekie is similar in appearance to the adult but with a more brownish, less glossy tinge to the black feathers, especially on the throat and upper-breast and with a much smaller white arc above the eyes. 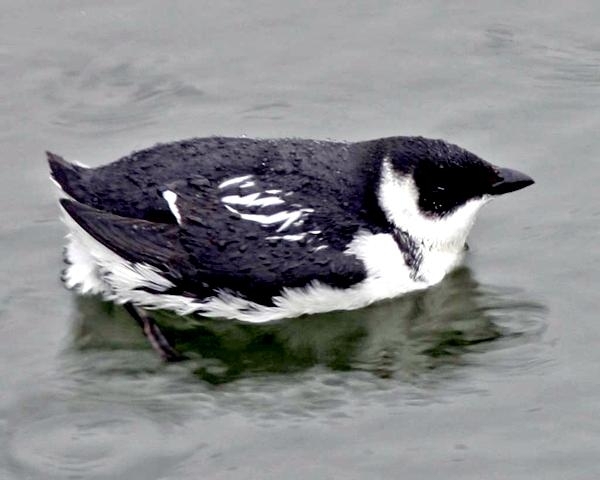 The Dovekie is a stout, compact seabird with a very small, robust, sparrow-like bill which is so short & fat that the Dovekie almost appears to have no neck. 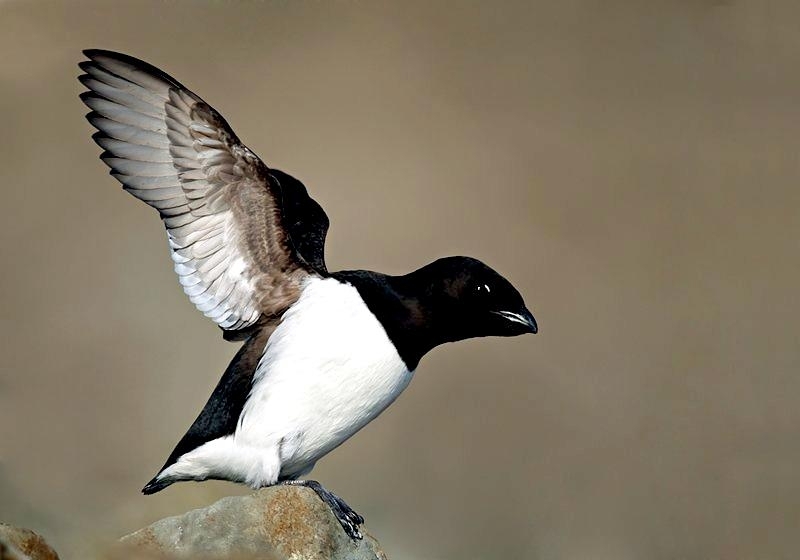 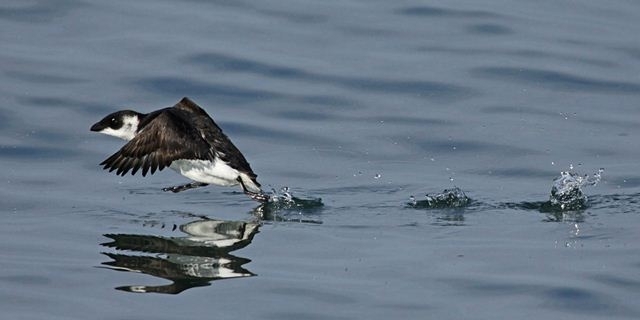 Like other auks, the wings are small, the tail is short and the legs are positioned to the rear of the body, giving the bird an upright posture as it walks or jumps agilely on its webbed toes. 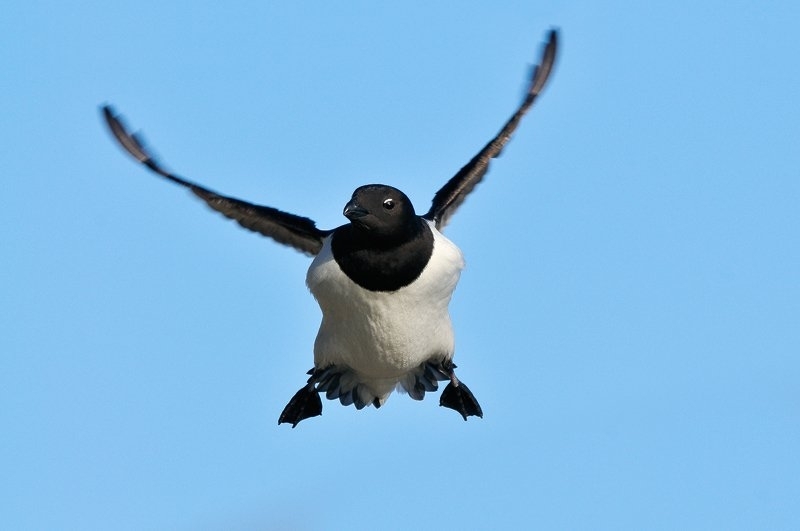 The Dovekie typically swims low on the water in a characteristic horizontal position and appears almost reckless in flight as it flies with rapid, insect-like, whirring wing-beats. 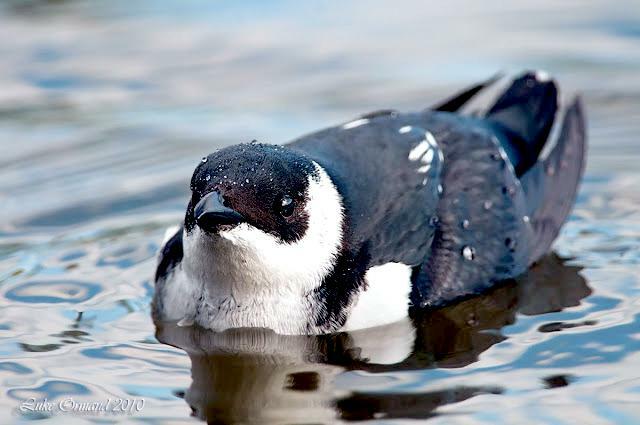 Feeding on a diet of tiny marine crustaceans, the Dovekie obtains is food by diving to depths of up to 35 meters, before using its natural buoyancy to swim upwards in a zig-zag pattern and capture its prey. 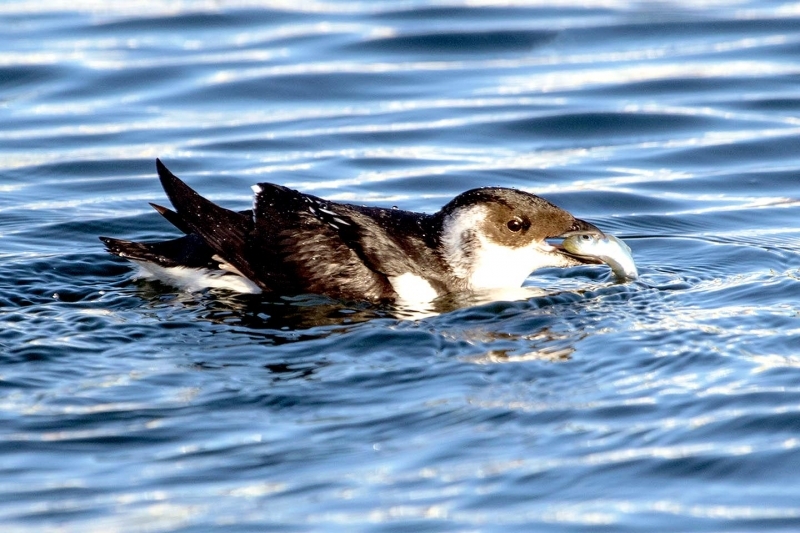 This allows its prey to be back-lit against the surface light and the prey items are then caught in the Dovekie’s small, wide bill. 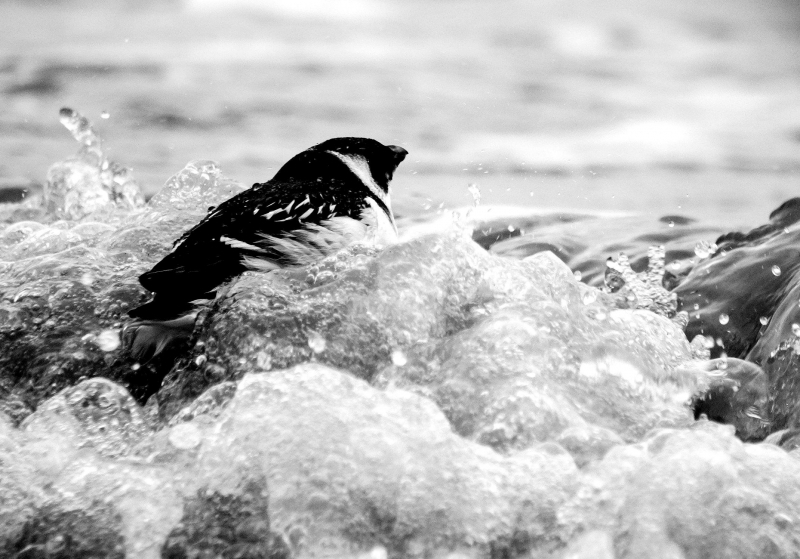 The Dovekie often feeds at night, when its prey migrates to the water surface. 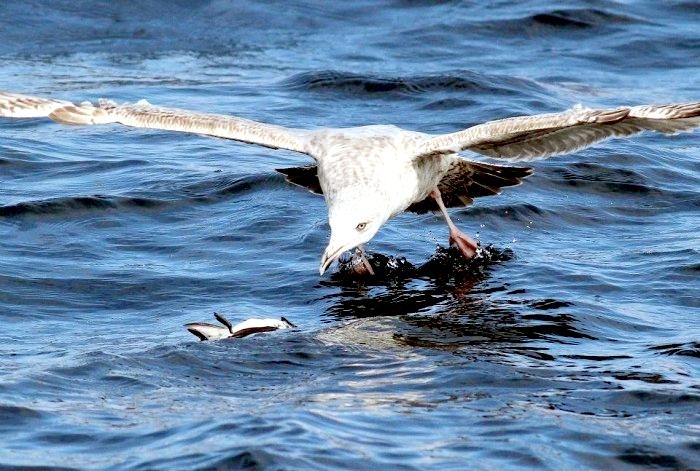 In some parts of its range mollusks & small fish are preferred prey and are captured after a short, rapid pursuit through aquatic vegetation. 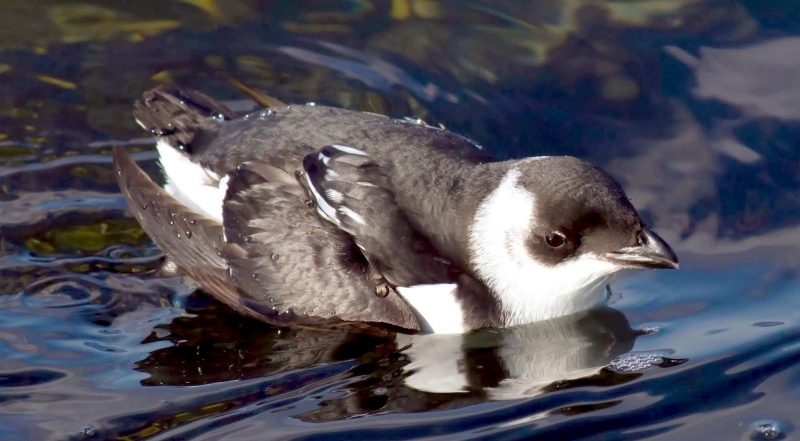 Breeding birds typically forage within 10 to 100 kilometers of colonies along ice edges, but at other times of the year the Dovekie floats passively on strong ocean currents, often with sustained flightless periods, feeding far out at sea. 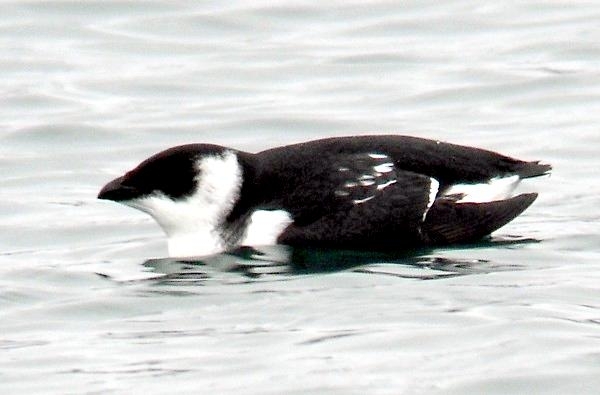 The Dovekie is the only auk species with a specialized, extensible pouch in the throat which is used to carry prey to nestlings. 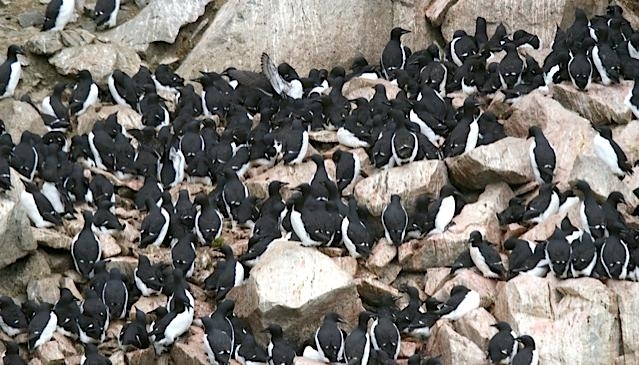 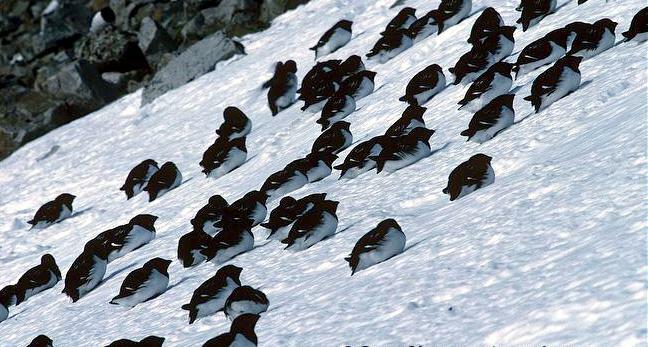 A highly gregarious species, the Dovekie breeds in huge, dense colonies which comprise more birds than any other auk colony, with the timing of breeding varying across the species’ range. 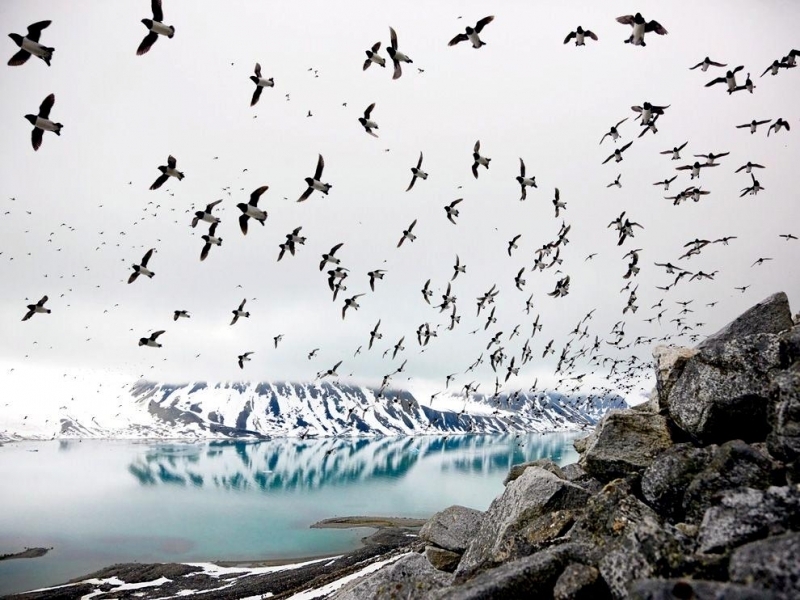 Prior to the onset of breeding, massive, noisy flocks of birds gather on the water near to the colony, before flying in wide circles while emitting loud calls and gradually making their way to land. 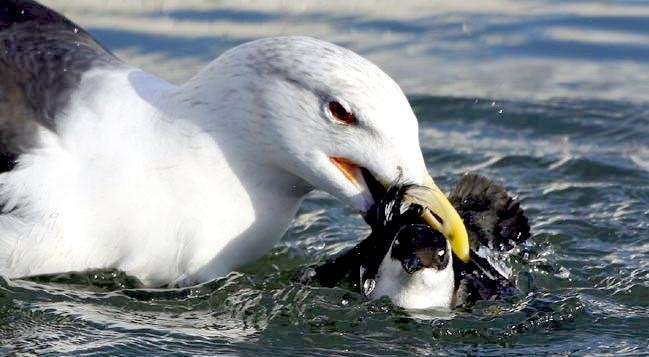 Competition for favorable nesting sites is fierce and can lead to fights between birds, with dominant birds chasing opponents in the air. 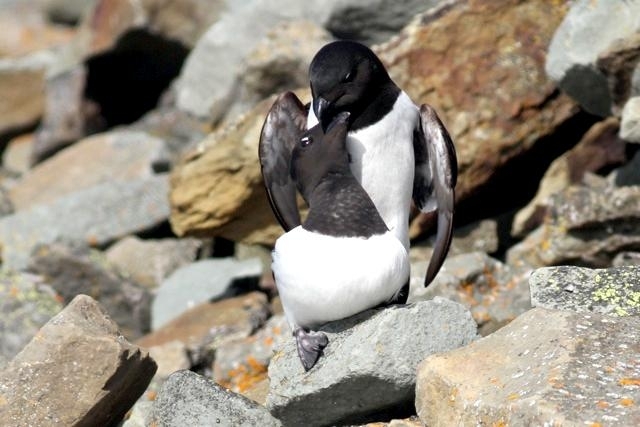 Once a nest site is obtained, Dovekies defend with territorial displays of head-bowing and upright walking with the back arched and the bill pointed upwards. 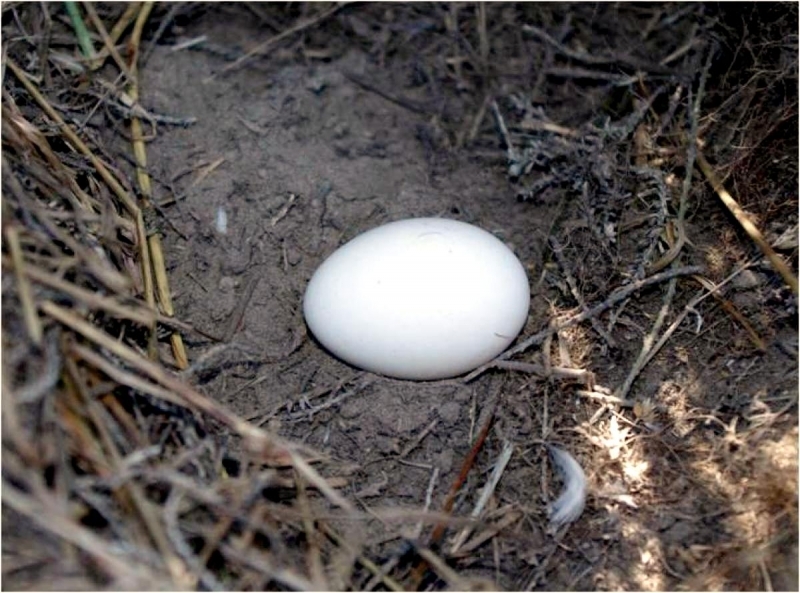 The nest is a simple bed of pebbles in a sheltered crevice among a field of boulders and the single egg is incubated for around 29 days by both the male & female. 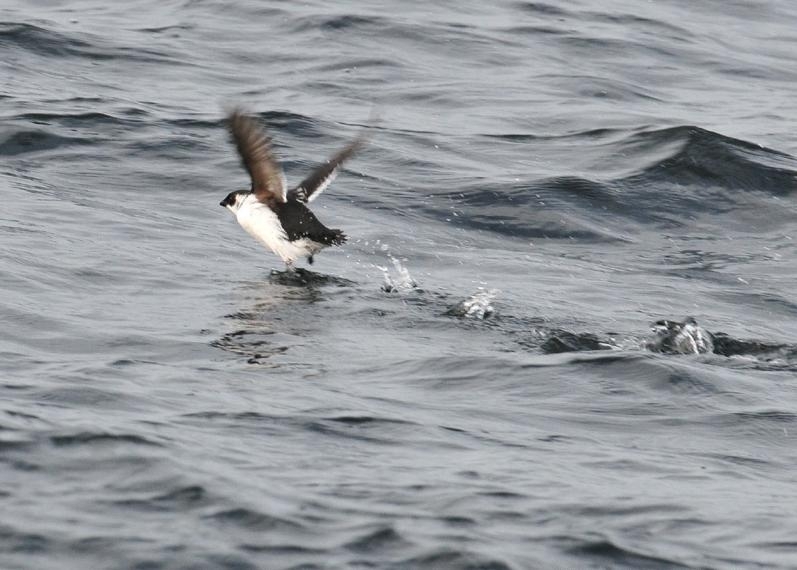 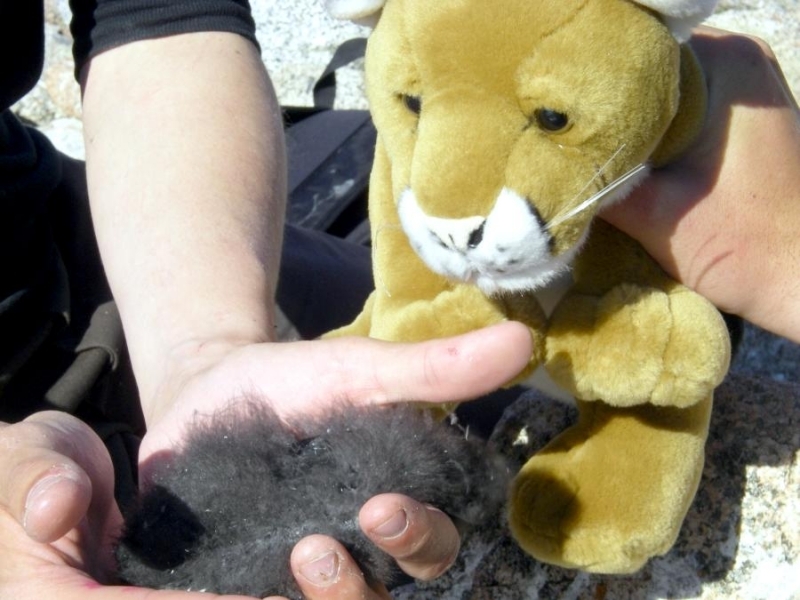 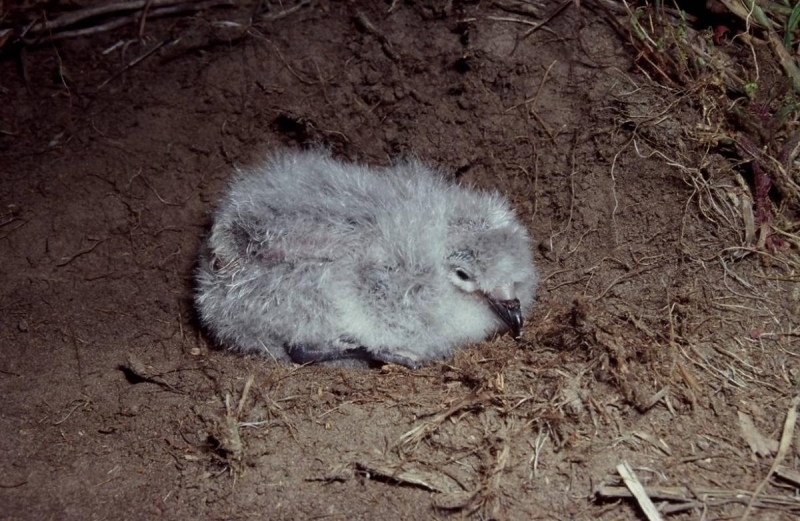 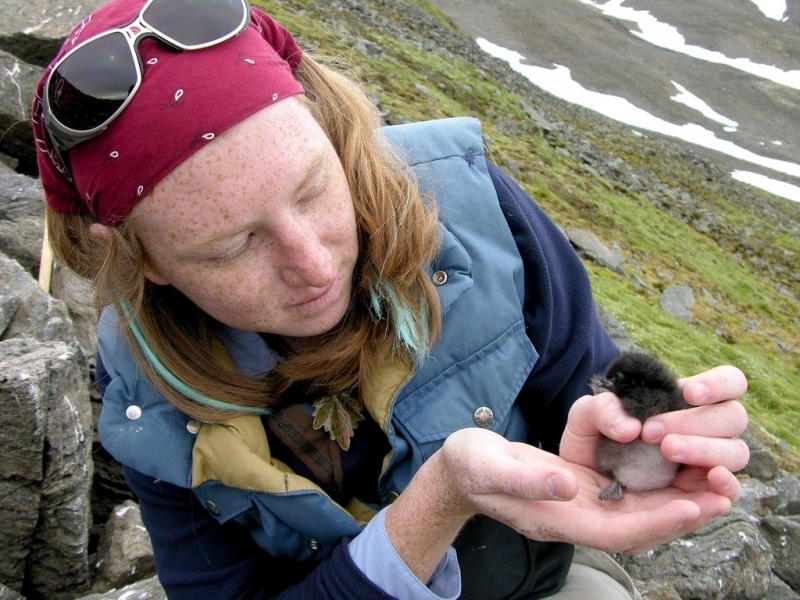 The chick fledges after 27 to 30 days, after which it becomes fully independent and flies out to sea alone. 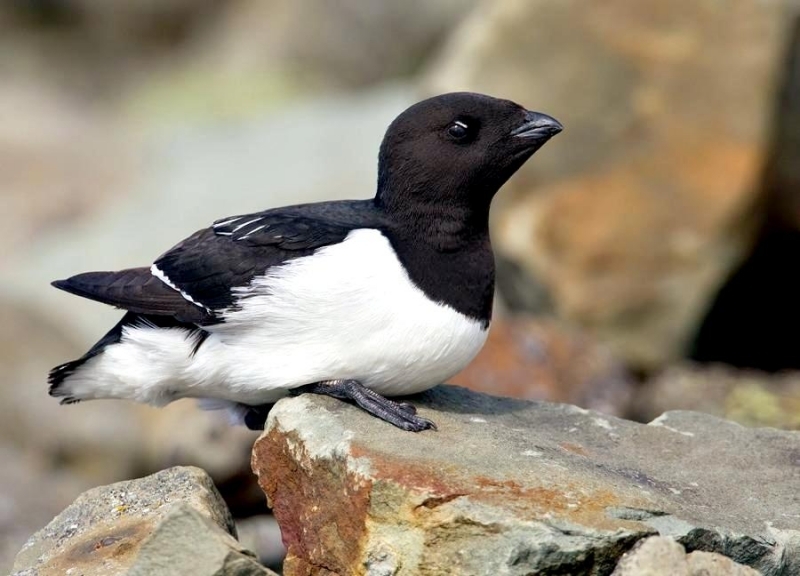 Once the colonies are abandoned at the end of August, the Dovekie undertakes lengthy southward migrations. 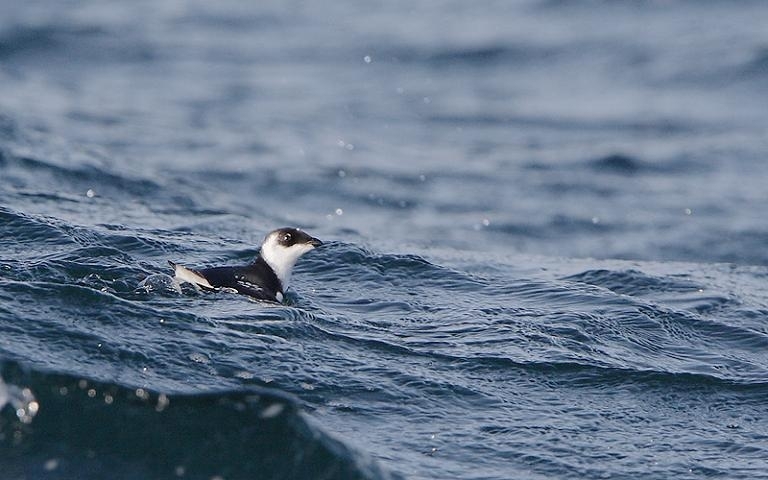 Typically it stays far out at sea but after strong storms, weakened, starving birds are quite often pushed landwards and turn up in areas where they are not normally found. 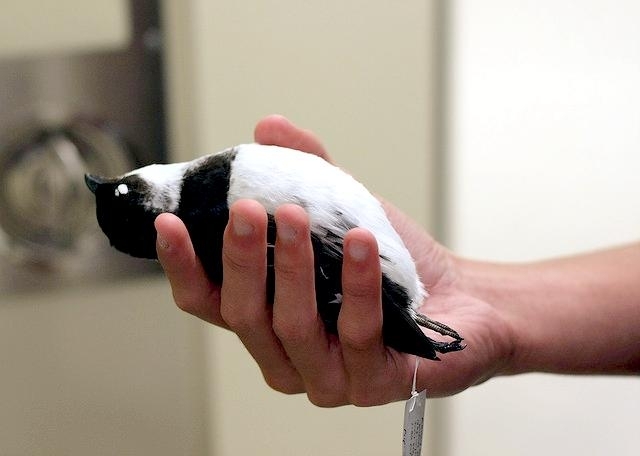 One such notable occasion was in the winter of 1932-1933, when huge numbers of Dovekies washed up along the entire eastern coast of North America, with birds even being found on the streets of New York and as far away as Michigan. 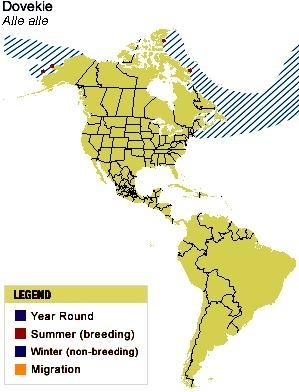 During the summer, the Dovekie breeds on islands around the Arctic being found on islands in the Bering Sea across to northern Canada, Greenland, Iceland, Svalbard and northern Russia. 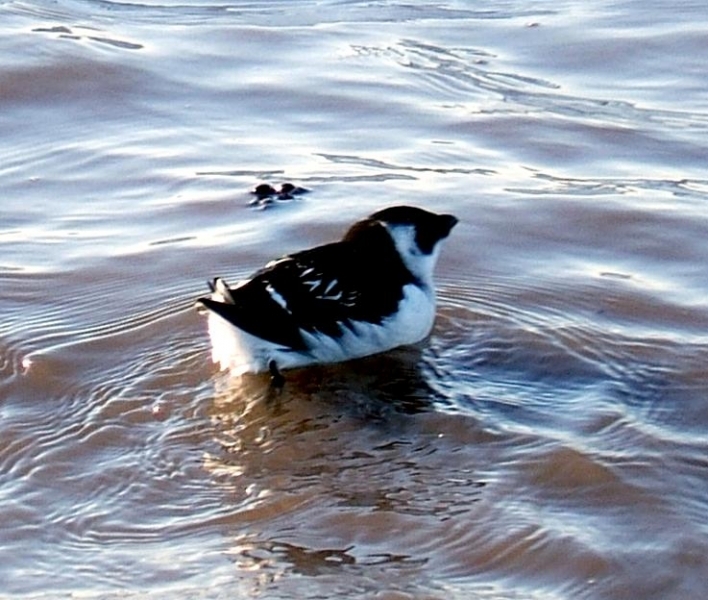 A migratory species, before the onset of winter the Dovekie travels southwards, when it largely resides in low Arctic waters but may be found as far south as the United Kingdom and northeast USA. 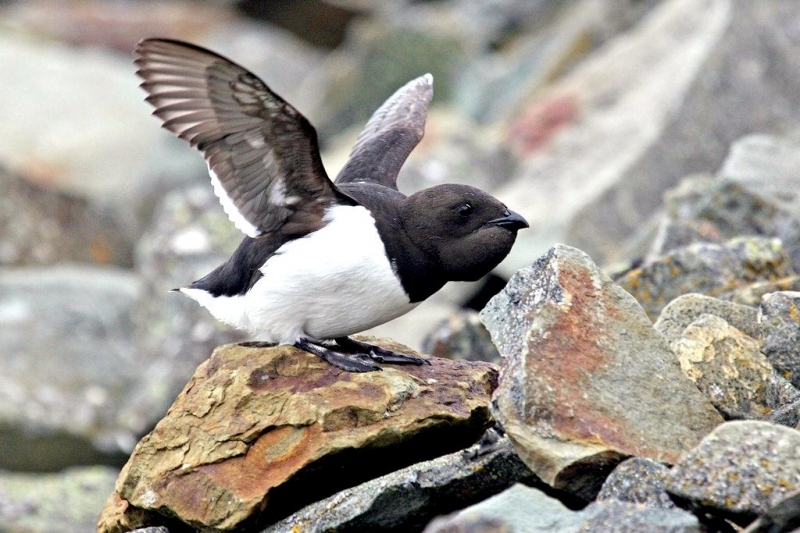 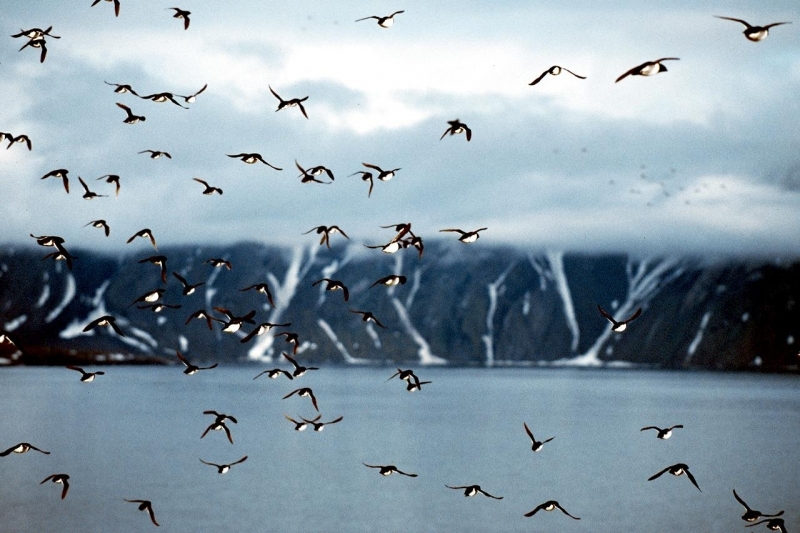 The majority of the Dovekie’s population occurs in north-western Greenland, where as many as 14 million birds may be found during the summer, before wintering off Newfoundland & Nova Scotia. 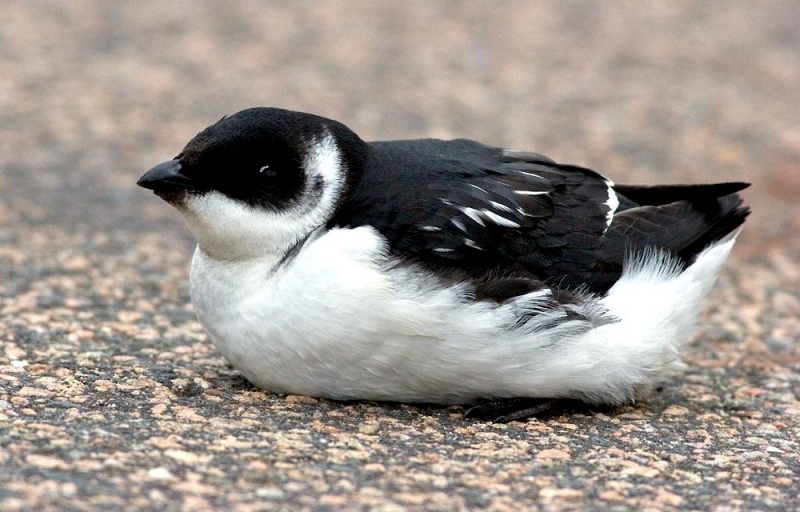 With a huge global population which likely numbers over 30 million birds, the Dovekie is an abundant species that lacks any known major threats to its survival. 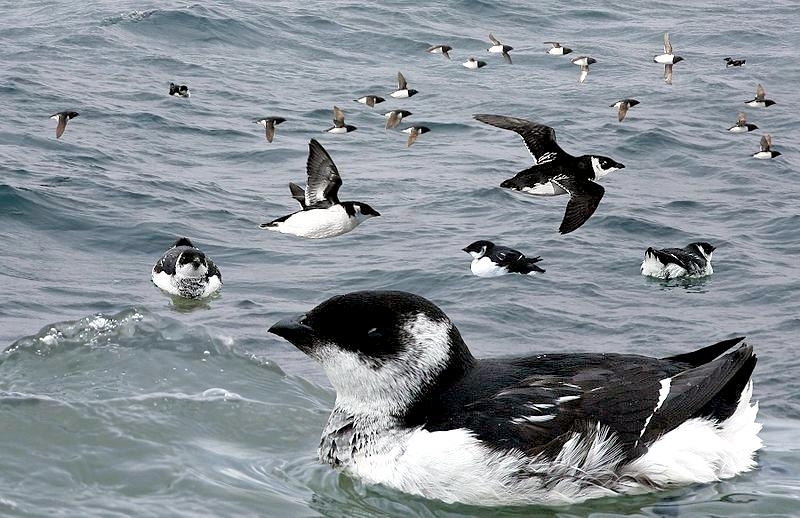 However, due to its rather docile nature while on land and the ease with which its colonies can be accessed, the Dovekie is quite intensively hunted in parts of its range and in the 1980’s as many as 500,000 birds may have been killed each year in Greenland alone, although today this exploitation likely numbers around 65,000 annually. 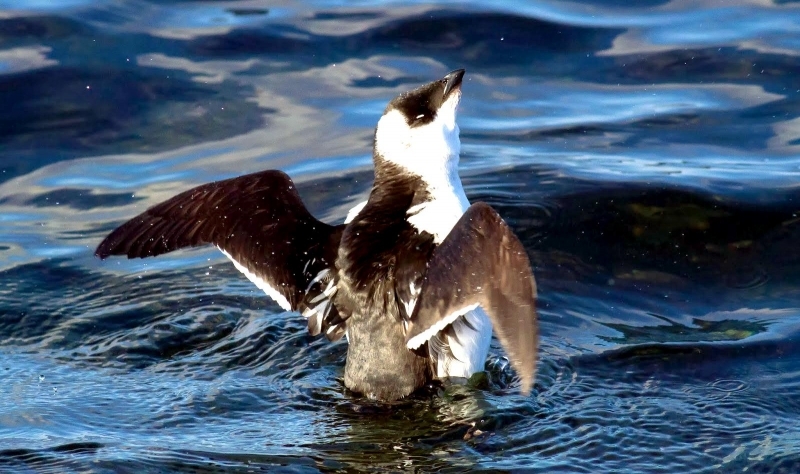 The Dovekie is also extremely vulnerable to oil spills due to its surface feeding habits with as many as 60,000 to 80,000 Dovekies killed by oil waste along the coast of Newfoundland each year. 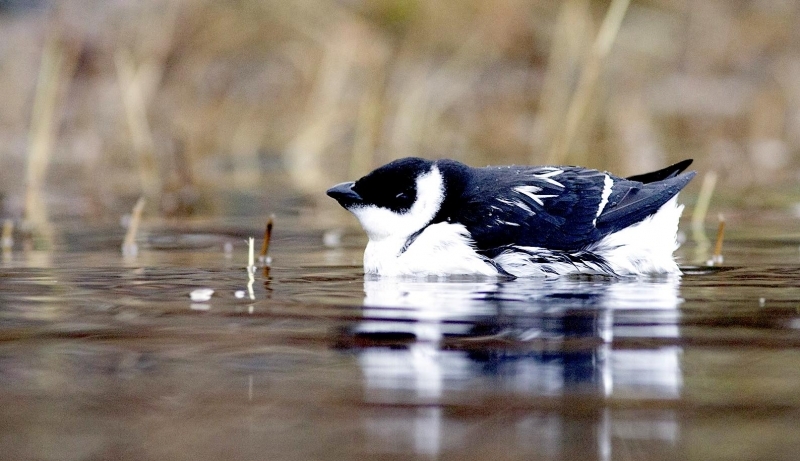 The Dovekie is also potentially threatened by toxic pesticides, which accumulate in its body tissues after eating contaminated prey and by global climate change, which may alter the snow & ice cover around its breeding colonies.